Is anyone having as much fun on stage as the cast of Kokandy’s production of The Wiz? Sure, there’s an argument that can be made for other shows and also a fair argument that they were just acting like they were having fun, but that’s not what this is about. This is about a group of people having so much fun on stage that the audience has to resist the urge to join them during dance numbers. Theatre as an art form is as much about message and passion as it is about escapism. Great art can take you somewhere outside of yourself. The biggest credit to this production is that they managed to do that. 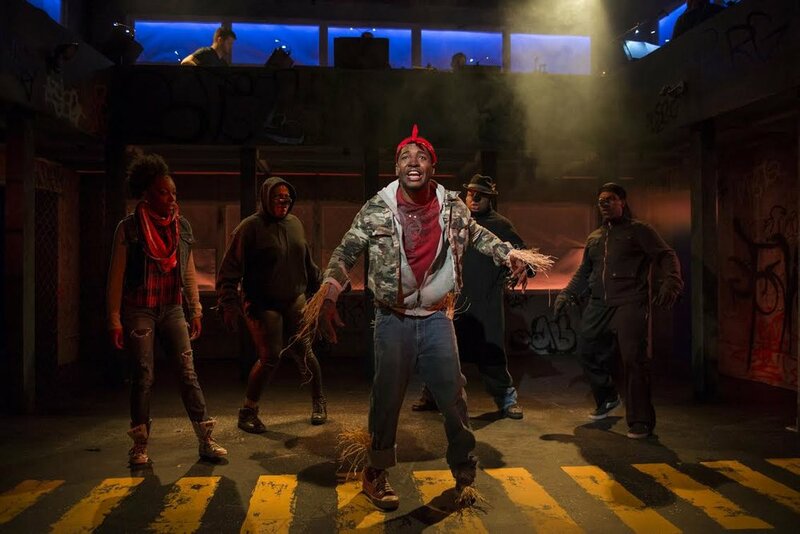 I could hurl superlatives at this inspiringly talented cast of this hip-hop infused retelling of The Wizard of Oz, but first, the couple of drawbacks. First, act two dies. In terms of momentum, the second act has none. Where the first act is a funky unstoppable bulldozer, the second act falls asleep in the poppy field. I have nothing against Frederick Harris (who offers a great performance as the Wiz and can rock a pair of heels), but every interaction between Dorothy/the gang and the Wiz lacks any intrigue. This production (and really The Wiz in general) uses the plot very loosely. So, when the singing and dancing falls away and the acting has to rely on the meat of a plot, the actors have nothing to fall back on. It just dies. Second, it’s smart to update and modernize The Wiz. The musical practically begs to be made more modern. But a couple of the modernization choices felt a bit stilted and out of place. At one point, the Cowardly Lion is rather forcefully arrested and a bystander comes on to record the incident. The impulse makes sense, and it’s going for a poignant and powerful moment. It’s tastefully done, it’s not grotesque, but it also grinds the play to a halt. On the other end of the spectrum, the modernization ideas from Choreographer and Assistant Director Breon Arzell worked wonders. Arzell’s choreography gave the perfect amount of freedom to allow each actor to imbue the set dance moves with character and individuality. The incorporation of modern dance moves felt right at home in this production. It was inspiring to see a vision from director Lili-Anne Brown and Arzell that embraced the actual spirit of The Wiz. They grasped the soul of this urban retelling of a classic story and made it their own without over-worshipping the original. I’ve said all this without saying much about this spectacular cast. My notes had two words on the actors: “Insanely talented.” I stick to that. Save the couple points mentioned above, this cast—lead by an outstanding performance by Sydney Charles (Dorothy)—makes this show a must see. On top of the performances, the design team gives the show a fun bit of a Chicago flair. (Oz transportation workers decked out in CTA garb helping Dorothy and her friends ease on down the road? C’mon, that’s clever.) It’s a show that works to pull you out of your seat, but unfortunately falls a bit short when it comes time to actually finish a story. Kokandy Productions launches its fifth anniversary season with a revival of the Tony Award-winning Best Musical THE WIZ, with book by William F. Brown, music and lyrics by Charlie Smalls, directed by guest director Lili-Anne Brown, music direction by Jimmy Morehead and choreography by Breon Arzell. THE WIZ will play March 5 – April 16, 2017 at Theater Wit, 1229 W. Belmont Ave. in Chicago. Tickets are currently available at www.kokandyproductions.com, by calling (773) 975-8150 or in person at the Theater Wit Box Office. (left to right) Steven Perkins, Chuckie Benson, Sydney Charles and Gilbert Domally in Kokandy Productions’ revival of THE WIZ. Photo by Michael Brosilow. (left to right) Gilbert Domally, Chuckie Benson, Sydney Charles, Steven Perkins and Frederick Harris in Kokandy Productions’ revival of THE WIZ. Photo by Michael Brosilow. The cast of Kokandy Productions’ revival of THE WIZ. Photo by Michael Brosilow. Nicole Michelle Haskins with the cast of Kokandy Productions’ revival of THE WIZ. Photo by Michael Brosilow. Gilbert Domally with (back, l to r) Sydney Charles, Nicole Michelle Haskins, Frederick Harris and Breon Arzell in Kokandy Productions’ revival of THE WIZ. Photo by Michael Brosilow. 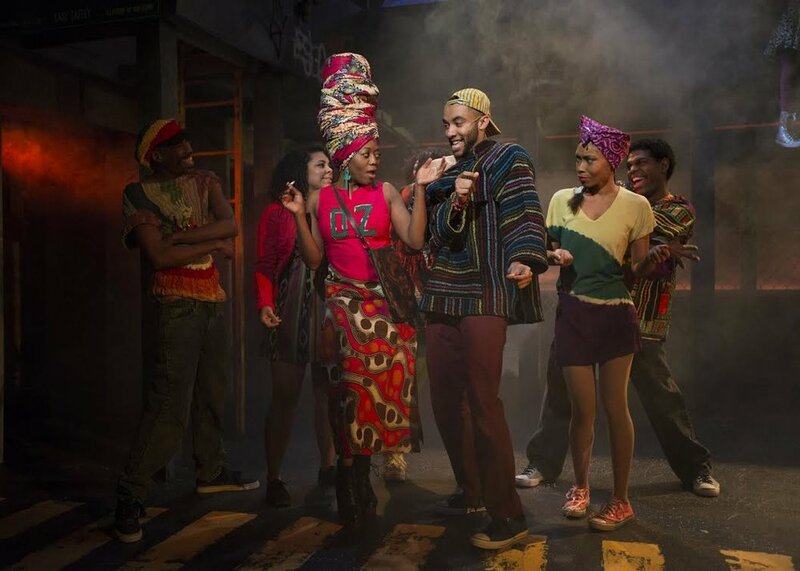 Angela Alise and Desmond Gray with (back, l to r) TJ Crawford, Anna Dauzvardis, Tia L. Pinson and Breon Arzell in Kokandy Productions’ revival of THE WIZ. Photo by Michael Brosilow.